This contemporary art space is built around Josep Suñol’s private collection of 1,200 artworks by over 200 artists including Andy Warhol, Picasso, Miró, Dalí, Tàpies, Man Ray, Giacometti, Solano, Jaume Plensa and Darío Villalba. 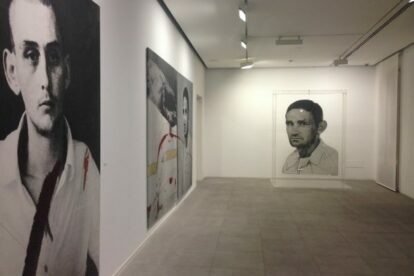 There are three showing spaces: two galleries accessed from Passeig de Gràcia, which feature themed exhibitions drawn from the collection, and Nivell Zero, which hosts touring exhibitions of contemporary sculpture and audio-visual work, occasional concerts, poetry gigs and workshops, which is accessed from Carrer Rosselló. The collector’s father, Josep Sunyol, was a very interesting figure. He was a political firebrand who founded La Rambla, a radical Republican newspaper which rallied opposition to the then dictator, Primo de Rivera. Despite, or more likely because of, his politics he became president of FC Barcelona in 1935. In August, 1936, just weeks after the start of Civil War, he was murdered by Franco’s troops. I really enjoy visits here. It is a beautiful and well organised art space. The quality of the work is always very good and the quality of the hanging is excellent. They really care about the artwork here – and they make a lot of effort to show it at its best. If you have any interest at all in contemporary art then you must visit. It’s just around the corner, less than 2 minutes’ walk, from the exhibition space at La Pedrera, so you could visit both very easily.